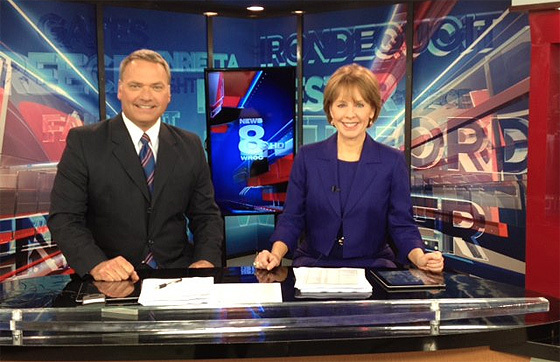 WROC-TV, the Nexstar CBS affiliate in Rochester, N.Y., launched in high definition last night. 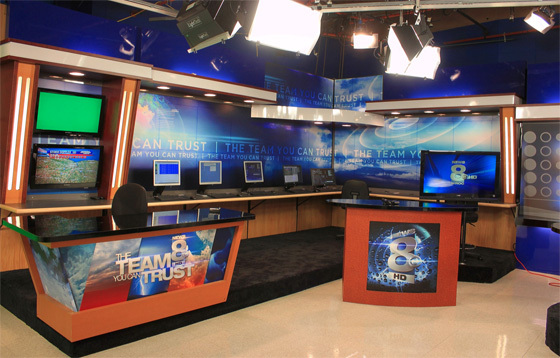 The set shares some similar elements with WBRE-TV, the Nexstar station in Wilkes-Barre, Pa. 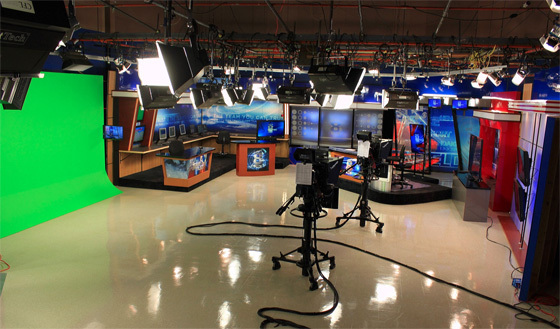 The main anchor area is situated in a corner of the studio backed with vertical frames and vertical flat screen. 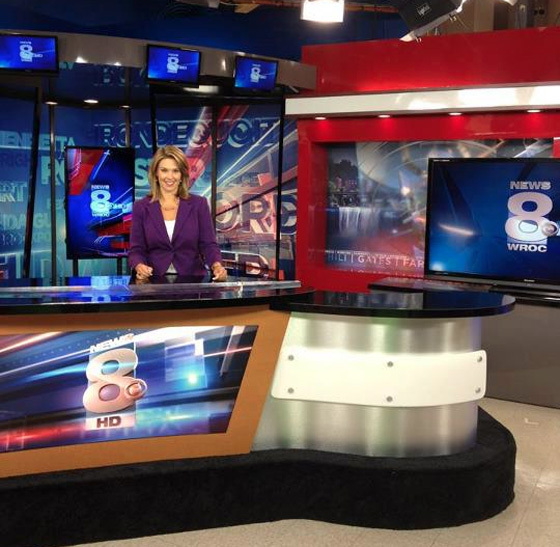 However, unlike WBRE-TV’s set, the WROC-TV look forgoes the heavier framework for a more open look. In addition, the Wilkes-Barre version of the set has framework that’s angled inward at a much more obvious tilt. Behind the frame is a large printed graphic that uses large stylized city names along with streaks of color. Overall, the background seems a bit overpowering and distracting. In addition, its colors a bit washed out in contrast to the bold reds and blues found in the station’s graphics package. To the right of the anchor desk is another printed graphic background along with an OTS monitor for sports and franchise segments. This wall is framed by a jarring red tone that stands in contrast to the wood tons found on other walls on the set. Camera left includes an three panel blurred monitor wall. This arrangement is similar to WBRE-TV’s set. The set also includes a new weather center — again, very similar to the one found at WBRE-TV. Large printed graphics encompass the L-shaped area that also includes work stations and two presentation positions, one featuring an OTS monitor and the other a stacked monitor array framed by two angled wood columns accented with lighted elements.